When DEXYS MIDNIGHT RUNNERS' 1980 album Searching For The Young Soul Rebels was a huge success, long-brewing tensions amongst band members and leader Kevin Rowland caused a major rift and the band split. Rowland was left with the Dexys name while most of the band formed a similar sounding Soul-influenced outfit called The Bureau. Archer reactivated The Blue Ox Babes in the late '80s, bringing in some former Dexys members and giving the music business another shot. 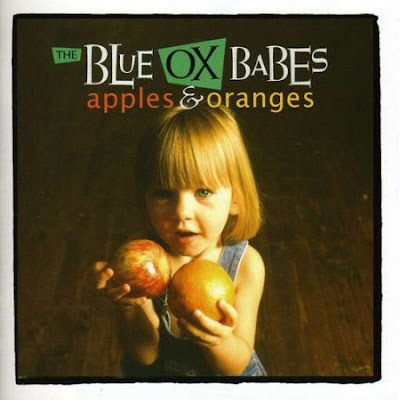 After a few semi-successful singles, The Babes were set to release their debut album, Apples And Oranges, in 1988 when fate stepped in yet again: their label, Go-Discs, decided not to release the album at all and dropped the band from their roster! Now, 21 years later, the album FINALLY gets an official release on Cherry Red complete with NINE bonus tracks and what a release it is! Apples And Oranges is everything you would expect a Dexys-related album to sound like... only better! Archer's voice recalls both Rowland and Liverpool legend Pete Wylie (with a little Marc Bolan quiver thrown in), while the band are accomplished and energetic. The production is top notch and the songs are FANTASTIC! I hate to compare them, but this would have been a great follow-up to Too Rye Aye! It makes you wonder why a label would choose not to release an album this strong, but it must not have fit into the then-current musical climate. Stand out tracks include "It Could Have Been Love", "Walking On This Line", the instrumental bonus track "The Last Detail" and "There's No Deceiving You". The cover of "Take Me To The River" is a bit awkward, but the rest of the album more than makes up for it. If you are a Dexys fan or just dig great timeless music, then this is a treat worth investing in. Oh, and you are more than welcome to throw away your copy of Don't Stand Me Down! I did!